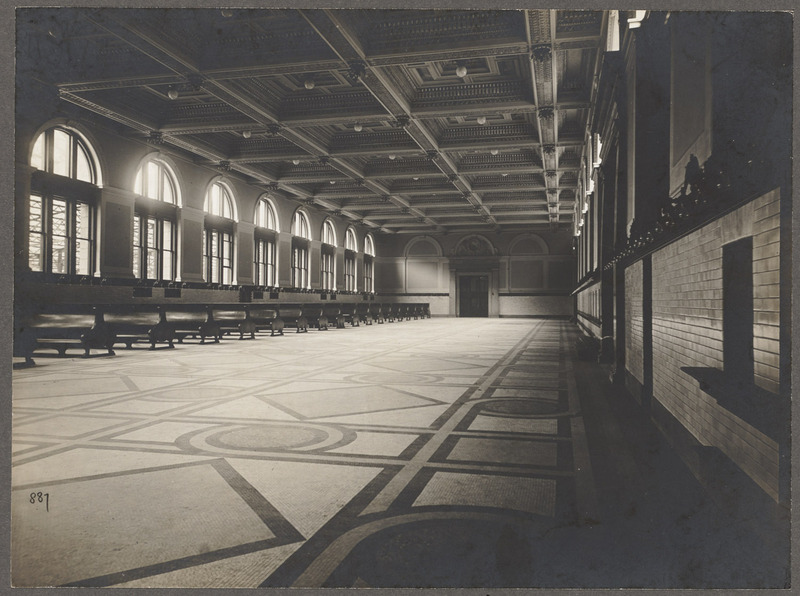 Found this beautiful picture in the BPL flickr sets of the General Waiting room @ South Station. Note the floor tiling. This is the original floor pattern used throughout the ground floor inside the station. The windows to the left point out towards Summer street. The wall on the right exits to the station midway & ticket booths. This room, although reduced in size, is now the ticket office for Amtrak inside the station. When the station was restored in 1989, they restored the remaining ceiling to its original glory. If you walk into the Amtrak ticket office, take a look-up and you can still see it. Also note the entrance on the right-hand side half way up. This is where the entrance to the waiting room joined the midway / platforms. This side of the entrance is very ornate with beautiful granite columns lining the entrance way and a cap that had "TO TRAINS" carved in it. Today, If you turn around inside the ticket office, you can still see this entrance with "TO TRAINS" etched in the granite door cap with the tapered columns on each side of the entrance. I found a series of photographs taken inside South Station during 1957. The photographs are part of collection from MIT Kepes-Lynch Photograph Collection. This collection documented Boston just before several major urban renewal projects kicked-in. The collection can be found starting here: South Station 1957. In most of the photographs you can see the lowered ceiling in the Midway section of the station. This was done during the late 1940s as part of an effort to reduce heating costs. Unfortunately, it also hid much of the stations best features as well. All in the name of "progress" of course. I love to perform research. If I had a "dream job" it would be "Historical Researcher". Nothing gives me more pleasure than to poke through a dusty archives and discovering things that haven't see n the light of day for many years. I usually make the pilgrimage down the National Archives & the Washington Navy yard twice a year to do research on U.S. Navy vessels.If you have never visited the National Archives in either Downtown Washington D.C. or @ College Park Maryland, you have no idea what you are missing. The U.S. Government has an enormous collection of information; all free to access. With Railroads, the search methods are pretty much the same except that most of the data is spread out among many different locations & collections. A considerable amount of data is in private collections which is much more difficult to access. When the major Railroads ran into very hard times in the 1960s, they unloaded most of their material to either the dumpster or anyone who asked for it. This is the main reason why so much of a railroad's information is in private hands. When I was sucked into this project, one of the first questions I asked is: "Are there any plans of South Station available" ? Although South Station (Actually, South Station is a terminal but we will refer to it as a station for now) itself still exists, much of the original building has been either destroyed or altered considerably. Having a set of for-real plans makes designing a scale model that much easier for obvious reasons. Once again, the nefarious Paul Cutler III, that souless bloodsucker who drop-kicked this idea in my head in the first place, started the ball rolling by pointing out an article he found in an obscure engineering journal called: Transactions of the American Society of Civil Engineers Volume XLIII published in 1900 by the Society. Paul claimed this journal contained some drawings of South Station itself , the trackage leading into the station, and more importantly: the Trainshed. Time to make some phone calls & write some emails. I read the article on the Construction of South Station Terminal in the Journal. The article goes into great detail on the construction, materials used, and operations once the terminal was placed in-service. The Journal contains an amazing amount of detail which is well worth sitting down to read. Of course, the article was written by an Engineer for engineers which is the reason why it is so interesting; at least to a researcher like myself. This gives me a complete copy of the article from the AMSCE. Now you, readers have copies as well. The most important things to note here is these are pretty much the only surviving documents of the Trainshed structure. Since the shed was torn-down in 1929, there would have been no need to keep the original architectural drawings on something that no longer exists. Likely the drawigns were disposed of when the shed was removed. If you also note, Plate VIII is the basement of the station plan. The basement was completed when the Terminal was built in 1898 but was never put into service. The basement trackage was never put into use as the original plan for electrification was canceled. There was 1 test where they tried to run a Steam locomotive through the basement loop. It met with disastrous results as there was no equipment in-place to deal with the exhausts from Steam Locomotives. The basement loop sat unused for many years until the post office was built in the 1950s. During this time the approach trackage was removed and the easements filled-in. The basement itself remained a storage area & employee parking for many years and is still used today. I've always wanted to design & build my own model train layout. I have wanted to do this for many years, but things like life, budget, and time itself just love to get in the way of our desires. You think that you might just be able to start that once-in-a-lifetime personal project, then some chain of events will reach into your life, take that idea right out of your head, and put it back in the dusty shelf where it sat quietly for so many years. However, earlier this year, events unfolded in my life that opened the door for me to finally be able to seriously think about building my own layout. In one of those rare moments, the stars & planets aligned, the skies cleared, and lo-and-behold, the opportunity to finally create my own layout appeared in front of my very eyes. Since the model railroading Gods smiled upon me & presented this opportunity, I decided to heed to their calling and actually try & build my very own model railroad layout. This layout would be mine to create. A miniature World where I would be the creator. So with that in-mind, I did what most people do in such circumstances; I bought some model railroad "how-to" books on scenery, layout design & construction, etc. During the summer months, I would spend time after work underneath the gazebo, sipping cold beer and gazing through books & magazines looking for nuggets of inspiration that might possibly lead me to what I wanted to build for my very first model railroad layout. I also started to clean out the space I used to use for manufacturing ship model kits. This would give me a sandbox of 42' x 62' feet to build the layout - plenty of room to do whatever I want. Now, before you say "start small my boy", I spent the last 20 years as a member of a fairly large model railroad club here in Massachusetts. During that time, I participated quite a bit in building that layout so I am quite experienced in most (notice how I say "most") aspects of layout design & construction. So, with talent, skill, and the motivation to play with model trains, I had everything required up-front to begin world-building on a grand scale. Unfortunately for me, one of my friends; namely Paul Cutler III who knows exactly how to push my buttons, playfully suggested that since I have the space, why not build South Station ? I thought about for a few minutes. Is. It. Possible ? Can I do it ? Unfortunately for me, I suffer from AMS. "A syndrome whereby a modeler becomes so obsessed with adding or acquiring every PE/resin aftermarket set for a particular subject to supplement the added minutae of detail that they must have on their model. This also includes copious research to make sure everything is in order and no detail missed. Modellers with this syndrome rarely complete a project. Cure for this problem is to go back to "basics" and build a kit in a weekend or two straight out of box." So, here we have it. My very first layout. Huge. Complicated. Expensive.